I am slowly getting ready for Christmas. Every day in December I am doing one thing in preparation for the Big Day. I have the world's most complicated planner with everything cross-referenced and linked to another day later on and a stack of magazines with pages turned down. We are entertaining lots this year (in fact we do every year) and so I am stocking the freezer with all sorts of lovely delights. 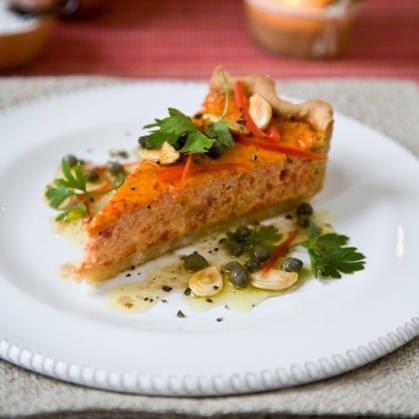 Today I have made the Roasted Red Pepper Tart from Good Housekeeping. It was super easy to make, and only uses a few ingredients. This is cooling in the kitchen now and will go in the freezer ready for Christmas. The photo and the full recipe come directly from Good Housekeeping - just visit here for more information. 1Preheat the oven to 180ºC (160ºC fan) mark 4. Roll out the pastry on a lightly floured surface, then line a 20.5cm x 2.5cm deep (8in x 1in) fluted loose-based flan tin. Prick all over, cover with greaseproof paper and baking beans and cook for 20min until pale golden. Remove paper and beans. 2Heat the oil in a frying pan. Gently fry the garlic and onion with a splash of cold water for 10–15min until soft and golden. 3Put the cooked onion, both types of pepper, the egg and cream into a food processor with some salt and plenty of freshly ground black pepper. Purée until quite smooth. Pour into the pastry case and return to the oven for 30–35min until the filling is just set. Put aside for 15min to cool slightly before serving warm with theParsley and Caper Salad.